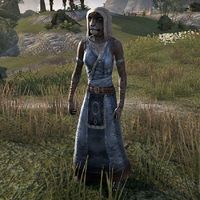 Halitazi-dra is a Khajiit alchemist who can be found at Windcatcher Plantation. Before the Great Tree is helped, she will occasionally talk with Ulphroth Grubnose about the recent problems. Halitazi-dra: "Over here!" or "What are you doing, Grubnose?" Ulphroth Grubnose: "There's no change, auntie. The sickness is spreading." Halitazi-dra: "Tell the spinner she must do something. It can't spread to the plantation!" Ulphroth Grubnose: "She's doing all she can. I'm sure of it." Once you have helped heal the Great Tree, she will recognize you. "I heard a stranger helped save the Great Tree. Thank you!" Additionally, she will occasionally wander over to the ledge and look down at the shore. Halitazi-dra: "Looks like the spinner's gone down to the beach." This page was last modified on 5 March 2019, at 11:45.